Work to Play program participants at Marquette elementary LOVE them some soccer. They prove it by being at the school bright and early each and every Tuesday and Thursday morning ready to go. However, students were in for a bit of a change of pace at practice one Thursday morning this Spring season. Instead of playing soccer, the team did a bit of gardening. 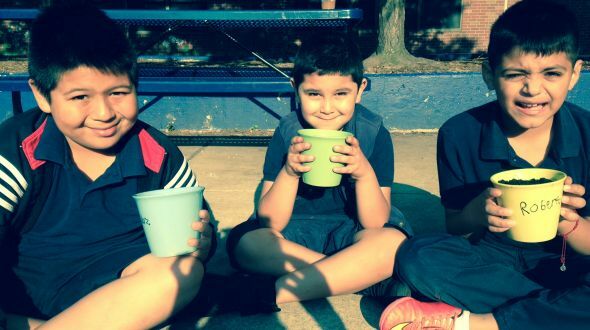 Coaches led a potted planting activity to help teach the students about making healthy food choices, so what better way teach the kids about eating healthy than having them grow their own vegetables! Each student received a ceramic pot, which they then filled it with soil. Coach Bryant, brought cilantro, tomato, and spinach seeds for the kids to chose from. The students then watered each of their pots and took them to Coach Gonzalez’s classroom and placed them by the window so they could soak in the sun. Our soccer players learned that they must water their plant everyday and place them in an area that receives a lot of sunlight in order to see maximum growth. The students really enjoyed the new activity which gave introduced them a new way to be healthy Student Athletes. Many of them took extra packets of seeds home to do some more planting of their own!